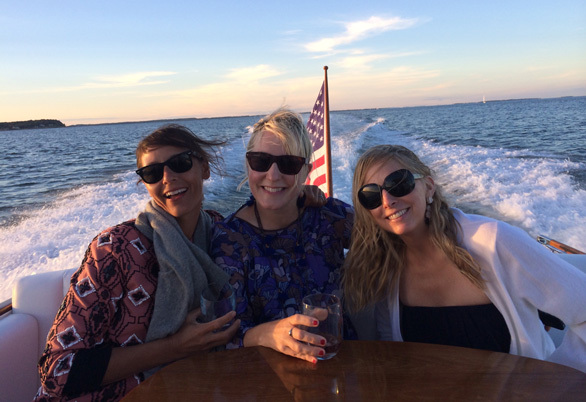 For Throw Back Thursday/Flashback Friday, I thought I'd share a picture of some friends (Sarah Meikle, fashion director at Conde Nast Traveler, in the middle, and clothing designer Beth Blake Dey, on the right) and me taken last summer, boating off the coast of Shelter Island, New York, windswept at wine o'clock! I am wearing a beaded (very Marni-esque) H&M jacket, which I bought last June and to this day wear like crazy. I truly love it! Turns out it's now again available on H&M's website. Don't ask why, just get it before it goes! I like to team it with tops like this Petit Bateau striped tee, this Suno ethnic-y embroidered blouse (or this one) and this basic black J.Crew sweater (30% off). Nice...you wear it so well! TTS?I never know with their coats. The jacket does run true to size. I bought a size 6. I would get it in black, too. Actually contemplating it now! It's a beauty! Very beautiful picture. You all look awesome.